True that the blaze of rapidly changing colors of the snow peaks as the sun strikes is an awesome view, but Tiger Hill is great even otherwise. It's a destination by itself offering not just great views during sunrise, it's a place where you can soak yourself with Himalayan beauty anytime during the day. 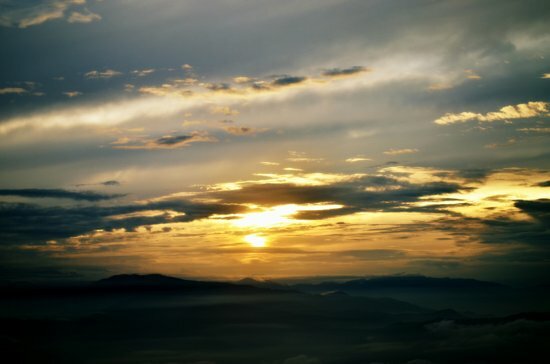 While I have been to Tiger Hill many times to experience the sunrise, I have also been there several times during the day and enjoyed as much. However, you must go there during the right season so that all the peaks are visible and there is no mist or fog cover around. Tiger Hill is located 11kms (6.8 miles) from Darjeeling town and above Ghum. 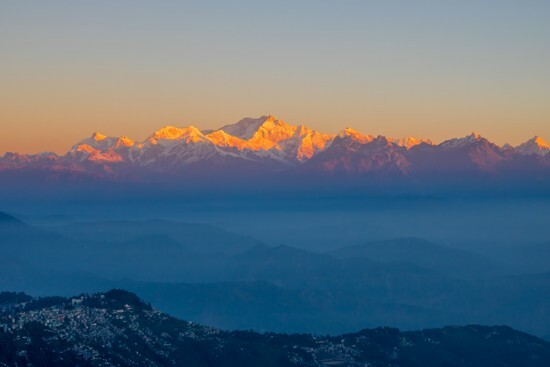 It's the highest point in Darjeeling hills at an altitude of 8482 feet (or 2590 meters). The best season to see the dazzling snow covered peaks as the sun rises is between Mid October to December. March to April is also a good time. For sunrise, you will need to start by 3:30am in the morning so that you reach by 4.15am. In winter you can start around 4:15am. Some taxi drivers will insist that you start even earlier. There is a reason why. As you reach close to the summit, particularly during the high season there would be a long queue of cars. Hundreds of tourists come here everyday for the sunrise view during the high season. As a result, you may have to walk uphill quite a bit as your vehicle may be parked much below the top. And if the Observatory Tower and the open viewing terrace next to it get full by the time you reach, then you will probably need to watch the sunrise standing on a meadow little below the summit. Remember, Darjeeling's weather can change anytime. The fog and the mist play a mystical game here all the time. They can come from nowhere and put a white blanket all around. You can't predict that. In fact, looking at the weather and the sky from Darjeeling Town is almost no indication of how the weather might be at Tiger Hill. Cloud and fog in this area lie at various levels of the mountains, some times they may be above you, other times you may be above them. So no one can guarantee a perfect sunrise view from Tiger Hill or for that matter from anywhere in Darjeeling. 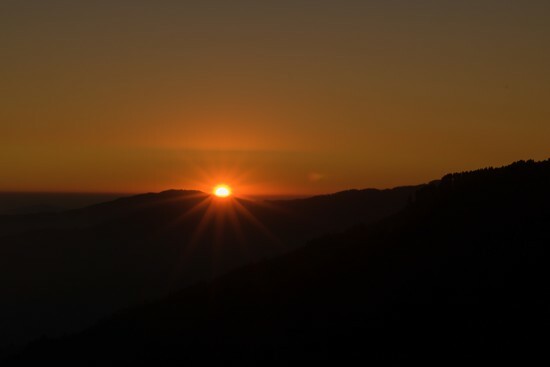 In many occasions, tourists are able to see the sun after it has risen quite a bit in the sky and not when they want to see it rising over the horizon and spreading its multicolor hue on the snow capped peaks. So, be prepared to experience the magical play of the sunrise the way the nature offers you. Now having set your expectation, let me start the journey and take you to Tiger Hill through my own eyes. From Darjeeling Town as you take the Hill Cart Road towards Ghum, there is a narrow road that goes up on the right few minutes before the Ghum station. This is the steep Senchal Road that leads to the top of Tiger Hill. As you start driving uphill, you will soon see the Ghum Jorebanglow Degree College on your right. You will then come to an abandoned toll booth. This was apparently setup few years back to take an entree fee of Rs. 200/- per vehicle. However the taxi union resisted the move and finally even after construction of the booth and printing of the tickets, the initiative fell through. As you drive up along the steep incline, there is a natural tree-lined hedge that runs up along the right unfortunately blocking some part of the view. On your left is the cliff that rises sharply. Tiger Hill area is now a part of a nature reserve and maintained by the GTA (Gorkhaland Territorial Administration, erstwhile DGHC). However as you drive along, you would probably not see much signs of maintenance. In several occasions I found the roads weren't repaired for years. With battering of torrential rains and harsh weather every year, you can imagine what may be the road conditions here having had no repairs over so many years. But the views all around and the thrill compensates for all that. Senchal road to Tiger Hill has been finally repaired. How long will it last, remains to be seen. After a few minutes if you look to your left, you will see a lovely meadow. This is from where many tourists view the sunrise if it gets too crowded on the top. In fact cars get lined up from here up to the summit during the high season. There used to be a tourist lodge here. You can still see a chimney like structure on the left that belonged to the abandoned tourist lodge. It was built during the British days as a VIP guest house when many eminent personalities came and watched the sunrise from here. It was later converted into a tourist lodge and was called the Dak Bunglow. In 1988 during a commotion in the hill area, the lodge was burnt and destroyed. It's lying abandoned since then. As you move along, there is a spot on the right side of the road from where you can get a view of the Senchal Lake down below which is part of a sanctuary. It's better to view it on your return as then it would be on your left. You can easily combine a visit to the lake or even a day's picnic there following a visit to Tiger Hill. As you drive up, you will see a temple on the left and another one on the right. The one on the left is that of Durga devi (known as Sincheal Singh Devi Dham) and the one on the right is of Lord Shanker. On your return, you can spend some time here in the tranquil temple environment and ring the hanging bells before you start your descent back to the hill town. Soon after this point as you move towards the top of Tiger Hill, you will see another toll booth. This is where a nominal fee (Rs. 10) per vehicle is charged as entree fee to the summit. You will also need to buy a ticket if you like to watch the sunrise from the observatory tower. You can also see the sunrise from the viewing area around the Observatory Tower and that's free of cost. During winter it can be very cold outside but the view is unabated and much better. The tower remains closed during the daytime after the early morning viewers have left. There are different ticket rates at the Observatory Tower depending on the level. The ground level ticket rate is Rs. 20/- per person, the 1st floor is Rs. 30/- and the top floor which has comfort seating with better views is Rs. 40/-. There are chairs arranged in rows in the other floors as well. Note that the rates are only indicative and may change with time. Within minutes you will reach the Observatory Tower. And then the Tiger Hill is all yours. You are on top of Darjeeling. From here you will get almost 360 degree view of Darjeeling area including that of the entire Eastern Himalayan range. If you look towards north, you will see the landscape of Darjeeling Town. And in the background is the stupendous snowy range. Just before the sun comes up, the peaks begin to emerge. It's hard to take your eyes off the dazzling snow peaks of Kanchenjunga, that has five treasure snow peaks, the highest of those being 28,169 ft (or 8,586 meters) which is the third highest peak of the world. On a clear day if the mist doesn't play foul, you can even see the world's highest peak Mount Everest 29,029 ft (8,848 meters) which lies about 225km away and also Mount Makalu 27,769 ft (8,464 meters). About 135km away is the Tibet's Chomol Hari Mountain which is said to be world's most beautiful peak. And then the sun rises above the horizon a little away from the peaks to the east. What more! During sunrise as you watch these wonders and nature's play in the horizon, the local vendors serve you hot tea in plastic cups. Update January 2019: The observatory tower to view the sunrise has been under construction since quite sometime. A new multi-storied observation deck is coming up. So expect a lot of building materials scattered around the place. On your way back, drop in at the Batasia Loop. Right outside, there are stalls set up early in the morning by the locals selling hot samosas (a kind of stuffed and fried dumplings) specifically for tourists returning from Tiger Hill. You would be hungry by now and samosas or singaras are just a great way to continue the treat of the day. By the way, many tourists specifically those from Kolkata who know about this, keep it as a 'must have' in their agenda for the day. Daily, from early morning wee hours until sunset. Note that although toilet facilities are available at the Observatory Tower, the authorities have done little to maintain them and keep them clean. This is despite the fact that many would need to use a toilet early in the morning. In several occasions I found the toilets so dirty and unclean that they were virtually unusable. 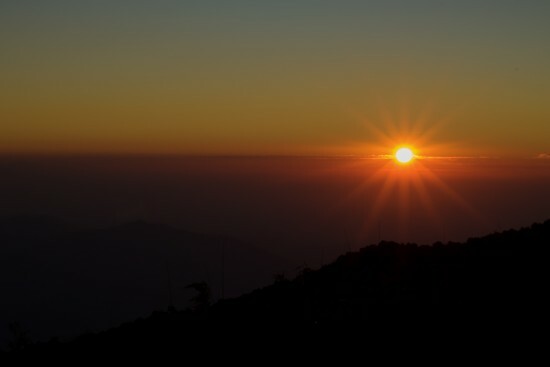 Many tourists can not fulfill their dreams of experiencing a perfect sunrise view from Tiger Hill with clear sky and Kanchenjunga range clearly visible... and that is mostly because of wrong timings of the year. You should avoid monsoon time (mid-June to end-September) when it rains frequently and the sky remains cloudy. October to November and March to May are great times when possibility of clear sky is maximum. During peak winter (i.e. December through February) the fog or mist can block visibility, but with some luck you can still experience a wonderful sunrise. Tiger Hill is 11km (6.8 miles) away from Darjeeling Town and above Ghum area. After the Ghum station, you will need to take the narrow uphill Senchal road on the right. It takes about 40 minutes from Darjeeling town to reach to the summit by car. You can either book your own car/cab or take a shared jeep that leaves from the Club Side Taxi stand at the base of Nehru Road and below the Mall. There are shared jeeps and taxis leaving from Chowk Bazaar area as well (note shared taxis are usually available in high tourist seasons). A reserved small cab would cost Rs. 800 - 1000 (Fare updated: February 2019). This cost can also cover two other attractions - Batasia Loop and Samten Choling (Ghum) monastery which are located on the way and the driver would agree for brief stoppages at these two points as part of a 3-Point tour. 1) Check out Ghum & Its Map to see the way to Tiger Hill. I want to know if first week of March is suitable to visit Darjeeling and to view the tiger hill. Please help me with that. March is usually a good time to get good sunrise view from Tiger Hill, April is even better. Thanks Raj, for the informative document. It was quite helpful and we really enjoyed the sunrise. We reached there pretty early and enjoyed the cup of coffee served by local women. But I think the observatory tower you are talking is no more there or it is being rebuilt, because all we could see was a structure (multi storied) under construction. Danger was that people were inside the same and unless administration take some urgent steps, a disaster is about to happen. Let people enjoy the mesmeric view and there should be somebody to control the crowds going into the under construction building. We saw the most beautiful sunrise with a spectacular display of colours over the Kanchanjungha peak, from the road near our hotel. Later on, towards afternoon we visited the Tiger Hill. From there we could see Mt.Everest, Mt. K2 and Kanchanjungha very clearly in the bright day light, through a telescope kept there for the tourists. Dear Raj, the site is very informative and helpful. I am planning to travel to Darjeeling during September 24-30 of 2016. I would like to know what are the chances of a clear sky during that time for viewing Kanchenjunga and sunrise at Tiger Hill. Thanks in advance and kudos for the great work you are doing! You have about 40% chance to see good sunrise from Tiger hill around that time. Hello Mr. Raj, thanks for a wonderful information about Darjeeling and Sikkim. We visited both Darjeeling and Gangtok from 14th to 19th March, 2016. The information provided by you was very useful. we could see the sunrise at the tiger hill but could not see the Kanchanjanga peak from there due to clouds. This was the situation even though we reached there by about 4-30 a.m. on 18th March, 2016. Hi Sandra, sorry I didn't notice your first email. Well, can't help much here. The facts behind naming Tiger Hill in Darjeeling is quite blurred. When I asked a few locals, one of them said that contour of the hill looks like a sitting tiger and hence the name. There is no record of any date and who named it. Locating Mt. Everest to the west of Kanchenjunga would have never been possible without Raj's mention of it in his guideline. While everyone was busy taking snaps of majestic Kanchenjunga, I found a snowy peak glimpsing like a pyramidal crown over another mountain. I confirmed it by asking a local guide. The moment it was discovered, all the lenses started focussing on it. I had been to Tiger Hills twice and again I see the opportunity to go there to witness the splendid awesome sunrise from the top of the hill. With monkey caps and heavy woolen colorful sweaters, we had our hot coffee cups from the local ladies, who trek to the sunrise point every day just after midnight, so that they can sell their coffee to the tourists in return of Rs.10/- only per cup at the early morning. Unless you behave otherwise, the ladies and girls of the locality are very honest, smiling and loving. The morning Coffee cup offered by them in the chilled weather of Tiger Hill, whilst witnessing the clouds playing just below you was really very enjoyable.